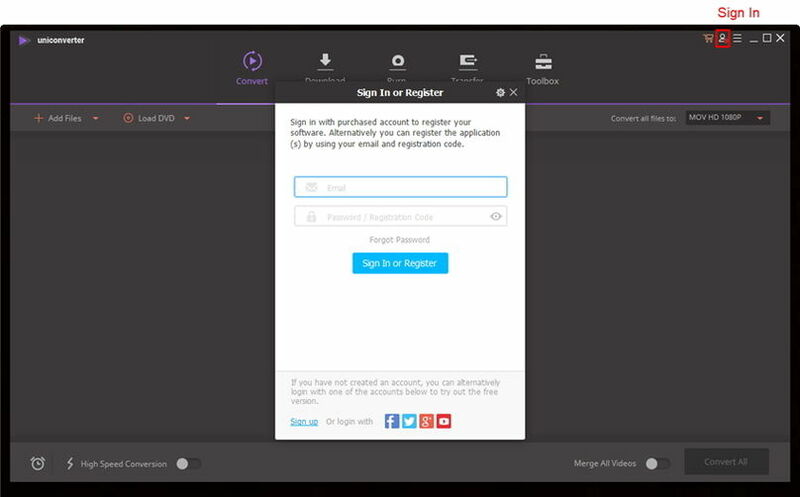 After the installation, open the program, click Main menu > Register to open the registration window, then copy and paste the following registration info to it. I have paid for the program, but why it still shows unregistered? 1. Make sure you activate the program with your licensed e-mail and registration code. Launch the software, go to the top menu, choose Software name > Register, you can check it there. After registration, the program will be registered as a full version. 2. If you want to remove the limitation of the trial version, such as watermark. You need to converter your original file again via the full version. Make sure you are logging in with the admin account. If there are many accounts on your Mac,you need to register the software under each account. Try to perform Disc Utility to reset all permissions. Go to Finder / Applications / Utilities / DiscUtility and select Macintosh HD / Click Repair Disc Permission. How do you uninstall Wondershare UniConverter for Mac (originally Wondershare Video Converter Ultimate for Mac)? To uninstall the application, you can drag the application to the Trash bin. If you could not uninstall the application by dragging to Trash bin, you can use a third-party application, AppCleaner, to uninstall it completely. How do you update Wondershare UniConverter for Mac (originally Wondershare Video Converter Ultimate for Mac)? Click on the top menu bar of UniConverter, then go to Check for Updates to update manually. To set up auto-updates, go to UniConverter > Preferences > General > Check for updates to select how frequent you want the software to check for updates.